Discussion in 'Colored Gemstones' started by Atwater, Jan 9, 2019. I am usually not a halo person and I like the stone to stand out on its own. However, for this specific chrysoberyl, maybe the halo will actually make it stand out more by accentuating the green in it? What's your opinion on the two settings and which one would you choose? Oh, I forgot to mention that the chrysoberyl is 8x9mm. Firstly what a beautiful stone!!!!! Love the green! The first ring is really pretty so if you're not into halos I think the fancy band is lovely. Even though I adore halos I'm not sure the second one would make it pop much more since you'll lose the fancy band and the halo is pretty small. Both pretty, but I like the halo better. I don't care for halos all that much when the center stone is a diamond, but I really love them for colored gemstones (and colored diamonds, too). I agree that the halo will help accentuate the green of the chrysoberyl--which is really lovely, by the way! AV_ and lovedogs like this. I vote halo! I’m a halo girl all the way and I think they just make CS gems pop. Gorgeous chrysoberyl btw. 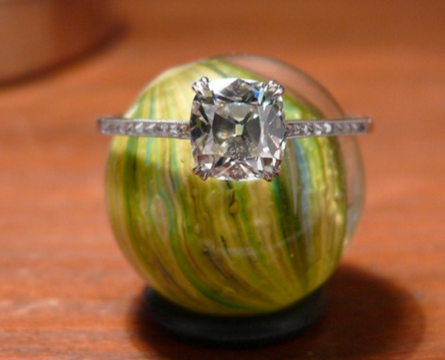 It will make a stunning ring...with or without a halo. indigoblue and lovedogs like this. I love halos so I'd recommend halo! Chrysoberyls are one of the few gemstones that I personally do not prefer in halos. I think they look better without them- maybe because I find the gem so fascinating to look at without any distractions. Either way- I am sure your ring will be gorgeous. I'm sorry I wasn't listening. I am not a halo person so I would say no halo-the stone is big and bright enough to hold its own! I think without halo the stone could start to look plain over months and years. That said, I would not do a white diamond halo, but a colored stone halo. Pink or red spinels, or some lavender sapphires, heated pinkish rubies etc., would definitely complement the green in your gem and provide lovely contrast. I like the halo more. Great stone too. I like the halo more because it kind of “elevates” the ring and complements the stone really well. The stone will shine with the halo. I also like the other setting. But I agree with another poster that you may get tired of the non-halo setting. I’d halo my house if I could!! junebug17 and Ladygrey like this. I vote halo - I just really like the combo of a colored stone with sparkly white diamonds, I feel the contrast makes a CS pop...imo the best of both worlds. IMHO, the one without the halo is more for casual wear whereas the one with halo is dressier, and given the stone which is lovely, I would opt for the latter.